The most popular diving specialties course. Itâ€™s easy and fun to capture images of your underwater scuba adventures. This specialty class is designed for someone who has purchased an underwater camera and wants to learn how to get better images or videos. The PADI S.E.A. (Shoot, Examine, Adjust) method for getting great shots quickly. Beyond using basic scuba equipment, you’ll need a digital underwater camera and a device for downloading and viewing your images. Snorkelers can enroll in the PADI Digital Underwater Photographer Level One course. For PADI Digital Underwater Photographer Level Two you need to be a certified diver, at least 10 years old, and fit for diving. Anyone at least 10 years old may enroll in the PADI Digital Underwater Photographer online program. Sign up for Digital Underwater Photographer Online using this link – PADI’s eLearning option – to get started immediately, US$183.00. The web-based system guides you through the principles of great underwater photography, with a bonus section on underwater imaging (including video). You study at your own pace through an easy-to-use, interactive program. You also have access to an online version of the Digital Underwater Photographer Manual. If you don't use this link and sign up from PADI.com, you will need to affiliate your class with Ocean Frontiers in the Cayman Islands during the sign up process. You can opt to pay the PADI fees directly to PADI on their website, via the link above, to start immediately or pay everything at one time to Ocean Frontiers and we will email you a coupon code. Either way it costs the exact same. The PADI Digital Underwater Photographer Course Online includes all the knowledge development requirements for the course. If you want to take digital photos and video underwater this course will teach you how. In the first two sections, the focus is primarily on still photography – whether you take digital still images with a camera or camcorder. Section Three covers some specific tips on underwater video with digital cameras. Prior to certification as a PADI Digital Underwater Photographer Level One, you must complete a photo dive in a pool, confined open water or open water with a PADI Digital Underwater Photographer Specialty Instructor. 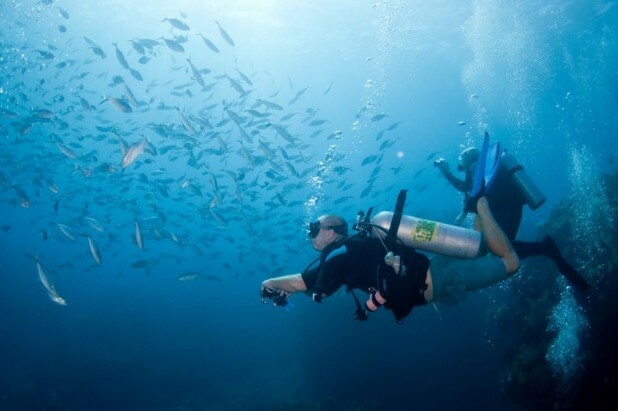 The Level One certification is open to snorkelers and the certification card issued for that level will state that it is a non-diving certification level. For PADI Open Water Diver course students who have completed all, water skills, or divers who are already certified, certification as a PADI Digital Underwater Photographer Level Two requires you to complete a second photo dive in open water. The PADI Digital Underwater Photographer Course online segment is $183.00 (US) nonrefundable. Ocean Frontiers PADI Dive Center will charge an additional $299 for photo dives. Once you finish the eLearning portion of the course, Ocean Frontiers is notified that you have completed it and that you are ready for the practical phase of the program. At the end of the eLearning program, you can print out Or save your eRecord and bring a copy of it with you to Ocean Frontiers PADI Dive Center.